Chicago Oracle Users Group - RAC Attack! 12c Workshop - "Hey Alfredo..."
The Chicago Oracle Users Group organized a great RAC Attack! 12c workshop last Saturday, August 22nd. Even with the gorgeous summer weather we had an amazing turnout! Over 30 people showed up to learn how to install Oracle RAC on virtual machines on their own laptops. I had a great team of mentors that were helping our participants in the workshop. A special thanks to Ashok Sivasankaran, Ittichai Chammavanijakul and Omar Ahmad for helping folks get past issues they may have had. Additionally, Ashok gave us a great presentation overview on Oracle RAC and Omar did one on VM templates for Oracle RAC. Both presentations are available for download on the COUG Web Site. 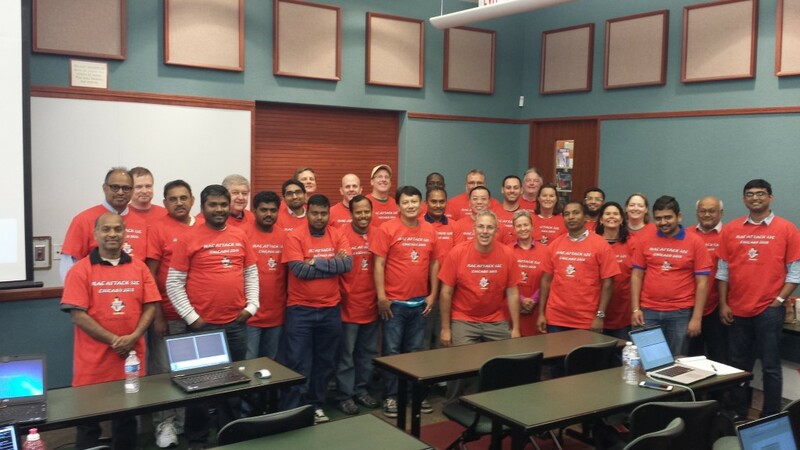 We were fortunate to have the Oracle Linux and Oracle Virtualization Team sponsor our workshop with not only coffee/donuts for our afternoon break but T-shirts for all our participants. I think the T-shirts turned out great and everyone really appreciated them! If you missed our workshop don’t worry, we will definitely have another one in the future! In the meantime, you can easily follow the instructions and get started at the RAC Attack 12c Wikibook. If you haven’t already, make sure to sign up as a COUG member (free!) and for our LinkedIn Group so you can stay informed of all of our events. Pingback: Chicago Oracle Users Group – Two Year Retrospective – "Hey Alfredo…"